One reason people enjoy casement windows so much is the sense of romance and mystery they add to a home. Much like a door, casement windows open outward with precision and ease. All it takes is one crank of the hand and your windows are open, allowing fresh air, cool breezes and the beauty of nature at its finest into your home like a welcome friend. The primary reason so many people choose this type of window is the sheer romance of a window like this. It’s stunning, and it’s a show-stopper. Having these windows displayed prominently in your home adds unparalleled aesthetic appeal. Casement windows are beautiful, but we know that you want a little bit more to go on when it comes to paying for new windows. Aside from looks, casement windows do offer a number of advantages that make them worthwhile in any home. One more benefit that homeowners do appreciate more than most others is the durability and the long-lasting ability of casement windows. These windows are simple in construction, but that does not mean they are simple in their lifespan, as well. Rather, they are known to be the type of vinyl replacement window that often lasts the longest and requires the least amount of work or maintenance. The one issue that you might encounter with a casement window is simple crank replacement as time goes on. However, cranks are inexpensive and easy to install, which means you are not inconvenienced in the least. 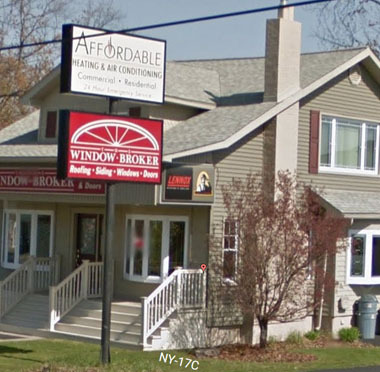 At The Window Broker, we know that something like changing out windows seems like it might be a complicated and costly project. Our team of experts is available to answer any questions and handle any concerns you might have, as well as discuss with you the many options we have available. Call us today at (607) 798-9954 to schedule a complimentary estimate on your new casement windows, or fill out the form on this page to schedule your free consultation for new windows designed to improve every aspect of your life.